Where have the Christian intellectuals gone? There can be no question that the public square is increasingly devoid of any serious Christian thought and depopulated of Christian thinkers. Alan Jacobs perceives that a full generation ago, "American intellectuals as a group lost the ability to hear the music of religious thought and practice." Surely, he added, "that happened at least in part because we Christian intellectuals ceased to play it for them." His recent essay, "The Watchmen: What Became of the Christian Intellectuals?," is more elegy than jeremiad, mournful of a day when consequential Christian intellectuals were taken seriously by the larger secular culture, serving as mediators between the worlds of belief and unbelief and making a difference in both worlds. "Half a century ago," Jacobs tells his readers, "such figures existed in America: serious Christian intellectuals who occupied a prominent place on the national stage. They are gone now. It would be worth our time to inquire why they disappeared, where they went, and whether--should such a thing be thought desirable--they might return." We are safe in assuming that Alan Jacobs thinks such a thing is indeed desirable. That is the very point of his essay, and he does not write without hope. Indeed, he is in a real sense the refutation of his own thesis. Jacobs, Distinguished Professor of the Humanities in the Honors Program of Baylor University, is himself a model of Christian scholarship and intellectual engagement. His several books are erudite, elegantly written, and each is a serious contribution to the world of scholarship. This is a man to be taken seriously and a generation of young Christian scholars takes him seriously indeed, and for good reason--he is a model of who they want to be. He is respected among established scholars as well. If his thesis is to be countered, he is an excellent counter example. Jacobs's essay appears in the September 2016 issue of Harper's Magazine, one of the more influential publications remaining in what is left of America's once-rich culture of literary magazines. That is not an accident, and it raises the question of intended audience. Does Professor Jacobs intend first to make secular liberals realize what they have lost, or does he want Christian scholars to realize what they have left undone? Perhaps both, but the fact that the essay appears in Harper's rather than a religious journal like First Things or Books & Culture is certainly a clue. Niebuhr and Lewis, Jacobs writes, "were famous men--appearing on the cover of TIME in 1947 and 1948, respectively." They did appear, of course, but less than twenty years later that same magazine would infamously ask "Is God Dead?," implying that the Age of Secularity had arrived. Jacobs explains that serious Christian intellectuals have, since the 1970s at the very least, suffered from a "Where Is Our Reinhold Niebuhr?" problem. I deeply appreciate Professor Jacobs's essay and I share his concern in general terms, but I see the situation somewhat differently. His critique of the current intellectual situation is accurate, and almost self-evidently so. His comments on the preoccupations of evangelical scholars and the vagueness of authors like Marilynne Robinson are apt. Evangelical scholars have generally addressed themselves to each other for the past few decades. But this is not so much a choice as a realization that the secular academy is either openly hostile or tone-deaf to "comprehensive worldviews," in the language of the late philosopher John Rawls. Meanwhile, the rare religious voices and literary figures who are cited and sometimes even feted within the intellectual salons are those who pose no threat of an awkward doctrine, much less any threat to the sexual revolution and its hegemony. My larger concern with Professor Jacobs's thoughtful article, however, has to do with the Protestant examples he cites. We might call this our "Where Are Our Reinhold Niebuhr and C. S. Lewis Problem." By any measure, Reinhold Niebuhr was a serious intellectual. His influence was, if only for his own generation, staggering in terms of relevance and power. I still read Niebuhr regularly, having devoted a great deal of study to him during my doctoral studies. Through him, I came to read American history in deeper shades of irony and all of human history in more profound depths of meaning. Several of my professors back in that day had been personally taught and deeply influenced by Niebuhr. It was in the course of my own reading of Niebuhr that I discovered the unorthodox nature of his own theology. He did indeed believe in a transcendent God, but he wavered in belief in a personal deity. He recovered an Augustinian tradition and drew from deep orthodox wellsprings in his understanding of the power of sin. At the same time, he also redefined the biblical doctrine, locating humanity's ultimate problem in society, not in the individual sinner. He openly dismissed biblical passages that did not fit his scheme. He embraced his own program of what Rudolf Bultmann called "demythologization." In his own words, "If we take the disciplines of the various sciences seriously, as we do, we must depart at one important point from the biblical picture of life and history." Actually, he departed from quite a few points. In the modern age, those who are intellectually aware "do not believe in the virgin birth, and we have difficulty with the physical resurrection of Christ." Further: "We do not believe, in other words, that revelatory events validate themselves by a divine break-through in the natural order." A "divine break-though in the natural order," we must note, is the heart of the Christian truth claim. His worldview was clear: "The accumulated evidence of the natural sciences convinces us that the realm of natural causation is more closed, and less subject to divine intervention, than the biblical world view assumes." That is not to depart from biblical Christianity "at one important point." That is to abandon the heart of biblical Christianity. Niebuhr's strategy, historian George Marsden explains, was to "reserve a place in modern culture for what he regarded as the essence of the Christian faith, a place that would be safe from the onslaughts of scientific naturalism. This "essence of the Christian faith" was Christianity stripped of its essential supernatural elements. As Marsden noted in his fine work, The Twilight of the American Enlightenment, "The grand irony of that strategy was that, while Niebuhr himself used it effectively as a way to preserve a public role for the Christian heritage, its subjective qualities made the faith wholly optional and dispensable." Or, as the late John Patrick Diggins noted in Why Niebuhr Now? : "Whether a supreme being exists was of less importance to Reinhold Niebuhr than the message Christianity holds out to humankind." Furthermore, Niebuhr was already too Christian for the intellectual elites when Harvard University President James B. Conant sought to bring Niebuhr to the Harvard faculty in 1943 by means of a special professorship answerable only to Conant himself. Even at that time, Niebuhr was unwelcome in the Harvard philosophy department in 1943. Conant knew better than to try to locate Niebuhr in that department. In the end, Niebuhr declined Conant's offer. Professor Jacobs's references to the cover stories in TIME magazine are noteworthy. TIME was dismissed by the elites as hopelessly "middlebrow," but even they would have coveted a place on TIME's cover. 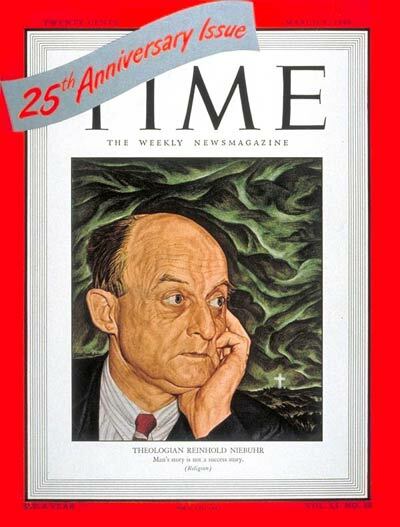 Niebuhr and Lewis were indeed both featured on TIME's iconic cover, indicating that both were seen by TIME as significant and newsworthy in the late 1940s. Jacobs understands their appearance in this context within the context of the Cold War. But there are even deeper ironies here. The TIME features on both Lewis (September 8, 1947) and Niebuhr (March 8, 1948) were written by Whittaker Chambers, then a TIME editor and later a central figure in the Alger Hiss spy scandal. Chambers was himself a former Communist and Soviet spy, before turning against Communism and testifying against Alger Hiss. We might say that, as a former Communist spy, Whittaker Chambers knew one when he saw one. We must note that both articles lend themselves to our argument. C. S. Lewis is identified as "one of a growing band of heretics among modern intellectuals: an intellectual who believes in God." "Outside his own Christian circle, Lewis is not particularly popular with his Oxford colleagues. Some resent his large student following. Others criticize his 'cheap' performances on the BBC and sneer at him as a 'popularizer...." But their most serious charge is that Lewis' theological pamphleteering is a kind of academic heresy." In the cover story on Niebuhr, we read the acknowledgement that "Reinhold Niebuhr's new orthodoxy is the oldtime religion put through the intellectual wringer. It is a re-examination of orthodoxy for an age dominated by such trends as rationalism, liberalism, Marxism, fascism, idealism, and the idea of progress." The "oldtime religion put through the intellectual wringer" was a wink and nod to the fact that what is left is not classical Christianity at all, but something far less. Alan Jacobs's essay in Harper's is brilliant and reflective. He raises truly important questions and offers keen insights into our current intellectual moment and the Christian intellectual responsibility. With him, I pray for a recovery of Christian intellectual influence. But there is no evidence that the secular gatekeepers are even willing to hear a minimalist or revisionist Christian argument, much less an argument based in orthodox Christianity that is not accommodated to the current Zeitgeist. I join in Professor Jacobs's lament over the failure of Christian intellectuals, for surely there is failure to be found. But we must be careful lest a quest for Christian intellectual influence meets its end in an intellect that is neither Christian nor influential. Alan Jacobs, "The Watchmen: What Became of the Christian Intellectuals?," Harper's Magazine, September 2016. David A. Hollinger, After Cloven Tongues of Fire: Protestant Liberalism in Modern American History (Princeton: Princeton University Press, 2013). See especially "Epilogue: Reinhold Niebuhr and Protestant Liberalism."